Welcome to the DraftKings Millionaire Maker review, ladies, and gentlemen. This will be a weekly digest of the DraftKings' Millionaire Maker to give you an idea of what it took to win $1 million in addition to seeing what some of the top professional DFS minds did in this large-field GPP. Each week thus far this season has offered a different dynamic. For Week 6, there were difficult scoring conditions in the first wave, with the late games serving as a “hammer” for DFS owners. DK user “ROB2622” won the Millionaire Maker this week with 229.66 points. Rob had a dominating performance, finishing a full 15 points ahead of second place. As we see with almost every winning lineup, Rob employed a “stacking” strategy through a quarterback and wide receiver duo of Russell Wilson and Doug Baldwin. Wilson was the best value for quarterbacks, according to DailyRoto's weekly customizable projections. Baldwin was also a top-tier value in DR's projections. However, both of these players were sub-10% in the Milly Maker, which allowed Rob to gain leverage on the rest of the field. It should come as no surprise that Ezekiel Elliott was chalk, in a great spot against the San Francisco 49ers. What couldn't necessarily be predicted was a 72-yard touchdown catch by Elliott in addition to 147 yards on the ground and two touchdowns. Quite simply put – Elliott was this week's slatebreaker. Another highly-owned running back, LeSean McCoy, had an extraordinary day. He was DR's cover boy this week and lived up to the hype, toting the rock for two touchdowns while adding five receptions to finish with 28.2 DK points. 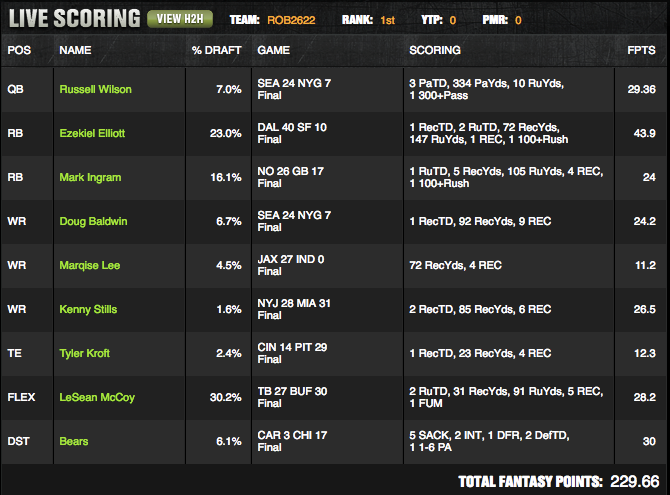 At 30% ownership, McCoy joined Elliott as a virtual must have in any winning GPP lineup. Rob used a trio of running backs in his winning lineup, the last of whom came from Week 5's winning Milly Maker lineup: Mark Ingram. Ingram was still fairly highly owned, likely due to his strong performance last week, and broke the 100 yard mark on the ground while getting into the end zone. The fun didn't stop there for Rob. The rest of his lineup featured a number of low-owned plays that broke out in a big way on Sunday. Chief among them was Kenny Stills, who took advantage of his increased role with teammate Devante Parker sitting out today's game. Stills got behind the New York Jets defense for two scores, the last of which came down the stretch, to end the day with 26.5 DK points. Since he paid up at running back with Elliott and McCoy, he needed to find another cheap wide receiver to pair with Stills to fit within the salary cap. At that point, Jacksonville Jaguars wide receiver Marqise Lee came into play. He was one of the top WR values in DR's projections and put up a respectable 11.2 DK points. He was also tackled at the one-yard line, or else this total could've been significantly higher. Another top DR value made an appearance on Rob's roster as tight end Tyler Kroft fit the bill. Although he caught just four balls, he bolstered his point total with a touchdown which made him a great play at just 2% ownership. When using the DR NFL Optimizer this morning, Kroft found his way into many of the top builds. Finally, as we saw last week, it is quite difficult to project what will happen with defenses. In Week 6, there were a few defenses that stepped out above the rest, but none more than the $2200 Chicago Bears. Once again, this was another spot where DR hit the nail on the head. The Bears were the second-best DK value and they scored two defensive touchdowns on a scoop-and-score, and an interception return, as well as adding five sacks. The 30-point defensive performance at 6% ownership put the Bears into prime GPP-winning territory. For the third straight week, a DFS pro finished in the Top 5 of the Milly Maker. CONDIA continued his torrid start to the NFL season by finishing fifth in this week's Milly Maker with a score of 213.82 DK points. CONDIA entered the Milly Maker with 78 lineups and used his 69th lineup (#nice) to take home a $30,000 payday. Contrary to the common stacking strategy that we discussed earlier, CONDIA went “naked” Tyrod Taylor and then employed a similar strategy to Rob by stacking up some of the game's best fantasy running backs. Instead of Elliott, McCoy, and Ingram, CONDIA paid up even further for a trio of Elliott, LeVeon Bell, and Todd Gurley. Bell and Gurley both had over 25 points, but this roster construction forced CONDIA to find value plays elsewhere. Luckily, Taylor was only $5100, so he was a top DR value and performed accordingly. Additionally, though, CONDIA found paydirt with three under $5k wide receivers to round out this dynamite lineup. We already mentioned Stills, but New Orleans Saints' WR Ted Ginn had almost as impressive of a day at just $4100, finishing with 24.1 DK points. Jermaine Kearse was the final leg of that cheap WR trio and although he only caught one pass on the day, he made it count – going 29 yards for a score. 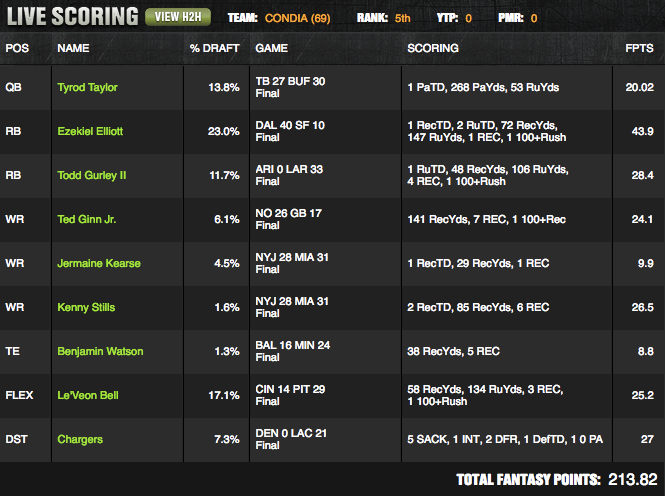 CONDIA actually got some #rungood from his lineup with his tight end play, Ben Watson. The entire undermanned Baltimore Ravens offense struggled mightily all day, but Watson was found by quarterback Joe Flacco several times on the final drive, which brought his daily total to 8.8 DK points. To finish off this lineup, CONDIA went with the “other” defense that smashed the day – the Los Angeles Chargers. Without Emmanuel Sanders and a banged up Trevor Siemian, the Broncos never got going and the Chargers took advantage, finishing with 27 DK points. Although he is normally a max-enter player, CONDIA's 78 lineups still featured some strong stances. For example, Bell found his way onto 44% of CONDIA's teams, despite being just 17% owned in the Milly Maker. Also, some of the values that CONDIA hit on in his fifth-place team, Ginn and Stills were on 13% of his teams despite being lower owned by the field. Taking stances on players that have high upside and are in good positions such as these can put you in a strong position to not only cash higher up in a GPP, but they also can maximize your minimum cash equity long-term, which is very important towards being a profitable DFS player.